The opportunity arose for me to purchase an Eddystone 730/4 spares or repair from the family of a Silent Key at a reasonable price, so I was pleased to purchase it as a project without prior knowledge of its condition. 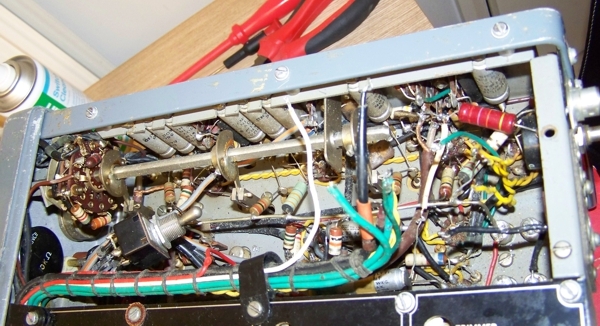 On examination of the receiver I found that the tuning dial was not working and underneath the chassis there was about 10 wires disconnected so I had to research the receiver to be able to get it in a condition that I was able to apply power to it without blowing myself or the set up. I downloaded the User Manual and other useful articles from the Eddystone User Group and set about the task of taking the front panel off so that I could sort out the problem with the tuning dial. Before starting this long winded task I gave all grub screws on the knobs a squirt of WD40 and left them for a couple of hours to loosen them up as previous experience with old sets had found undoing them could be a pain. 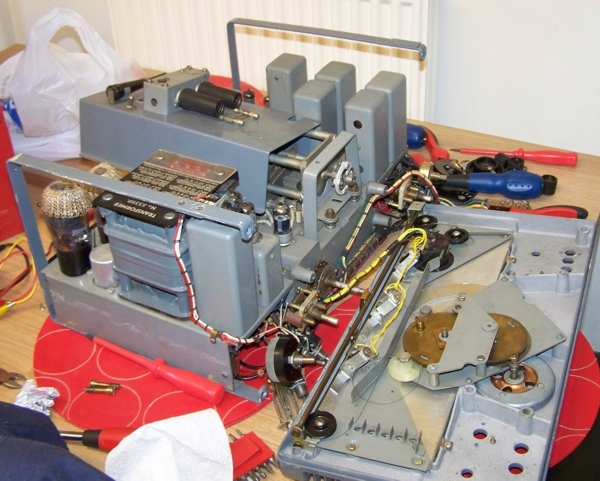 The picture above shows the front panel with the tuning capacitor gearbox attached, the gearbox was seized and had to be completely dismantled and the rust that had formed round the steel drive shafts that was stopping it turning was cleaned off. Everything else in the gearbox was also cleaned and greased so that the gearbox rotated freely then the pointer drive cord was fitted and the front panel was ready to be fitted back onto the chassis. Before fitting the front panel back, I thought it would be a good opportunity to clean all of the switches and variable resistors as I did not want to have to take the front panel off again. Before power could be applied, I had to figure out what had been done to the receiver which was a bit of a mess with disconnected wires under the chassis. Comparing it to the pictures I had of untouched receivers, I found out that a tag strip was missing from the right side of the picture where all the wires from the wiring loom should be attached, so I had to rewire it up again and I also found that a couple of valve heater wires had also been disconnected from the bottom of the valve bases. The switch under the chassis was the AF Filter switch and where that should have fitted on the front panel, a variable resistor had been added and fitted to the front panel where it had been wired in. 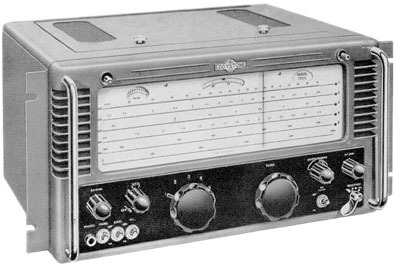 I removed the modifications and rewired the receiver to its original condition and switched it on. Much to my delight everything lit up and after a few seconds sound came from the loudspeaker, I tuned into a AM broadcast station and everything sounded OK so the receiver was working and now it was just a case of checking voltages and replacing faulty resistors and caps and tuning it up properly to get it back to A1 condition. PROPER JOB! I would like to thank the Eddystone User Group Forum for all the friendly advice and help I was given with this project. Boat Anchors! Are we Losing It?